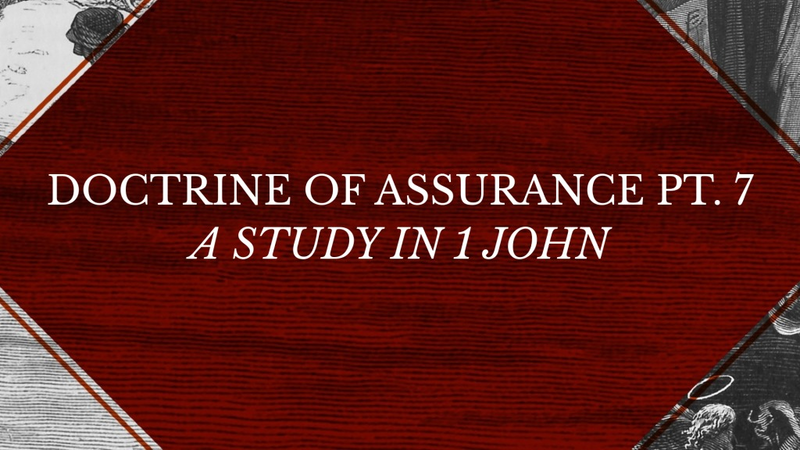 We’re nearing the end of our study on the doctrine of the assurance of salvation, with just 2 more considerations out of 1 John. You know that I prefer to be teaching systematically out of a book of the Bible at a time – but we’re taking a break from that to look at some individual topics. John is probing much deeper. He wants his readers to take a serious inventory of those indicators of new life in Jesus. Do I believe the Word of God is really God’s Word, and that it has ultimate authority in my life? Do I know what the Gospel is, and have I believed it? Believed it such that I’m aware the Bible says whoever DOES believe it and trusts Christ alone for their salvation – IS reconciled to God? Has my relationship to sin changed such that I now mourn and struggle against the very sins I still love in some way? Have I come to see that I have an almost inexplicable affinity for God’s people – whether we share anything else in common or not? Have a new set of values invaded my thinking so that the emptiness of what the World prizes grows stranger, and new things in Christ grow dearer? Has the Spirit of God opened my eyes so that the reality of who and what Jesus Christ is and what He has done is simply a part of the fabric of what I KNOW, not simply think or believe? A true inward conviction. This morning I had planned to go on and explore the question of whether or not I genuinely believe in, and am looking forward to the coming resurrection of the saints. But before we dive into that concept allow me to look briefly at 3 vitally important things. A bit of an excursus if you will – but central to everything we’re considering. And in light of the past few weeks, I will not keep you long this morning. I am repeating a lot because I know how the one struggling with assurance needs to hear these truths over and over and over. Please do not be insulted if you think this is too elementary for you. We never get away from the basics. Of all the books that have ever been and ever will be written in the English language, all of them will use the very same 26 letters. Of all the music written in the history of mankind (with slight consideration for quarter-tones), essentially all of it falls within the 12 note scale of the perfect octave. But when you consider the noetic effects of the Fall on the human mind, and how since the Fall we have trouble retaining sound doctrinal truth in our everyday consciousness – you see how going over and over and over the rudiments becomes absolutely necessary. It is why we not only meet here each Sunday for worship where were rehearse these truths in song and prayer and preaching – but why we have small groups, Wednesday night Bible study – and encourage you to be reading the Word on your own continually. Add to that an active Enemy of our souls who seeks to undermine the truth of the Gospel whenever possible, and the endless distractions of the world, and you see why this is necessary for all of us. Musicians practice their scales over and over and over. No matter how trained, or how long they’ve played. And Christians need to do no less if we are to live in a living and vivid reality of Biblical truth. Deuteronomy 11:18-20 Isn’t just a good suggestion, it is God addressing us with the knowledge of how these things escape us so easily. Proverbs 3:3 ESV / Let not steadfast love and faithfulness forsake you; bind them around your neck; write them on the tablet of your heart. Proverbs 6:21 ESV / Bind them on your heart always; tie them around your neck. Proverbs 7:3 ESV / bind them on your fingers; write them on the tablet of your heart. Remember that in each of these, John isn’t asking about levels of performance or feelings – but whether or not something of these is PRESENT within us. A few weeks ago I mentioned how medical science looks for 4 basic things to determine life in a human being: Respiration, Pulse, Blood Pressure and Body Temperature. Now those alone can’t tell you how healthy the individual is – but they can and DO indicate the presence of life. And that is what we are doing in this study – what John has been giving us by the inspiration of the Holy Spirit. In each case we are looking at the question of where I stand in relationship to these various things. And in some there might be a more pronounced reality than others. It isn’t how much of the Bible I know and understand, but what place of authority for truth it holds. Is sin troubling to me? At all? Simply because it is sin and offends my God? Am I learning the difference between the World’s values and the Bible’s and seeking to love what God values more? etc. But lastly I want to revisit the nature of what it means to believe the Gospel. I know we’ve covered this numerous times before but bear with me. This is truly central to everything we’ve covered so far, and will cover. It is absolutely central to your life and identity as a Christian. Notitia – Do I know what the Gospel actually is? Faith relies upon certain information. We do not just “believe” – we believe or disbelieve some particular information. Biblical faith is always – without exception – rooted in some information communicated by God. Biblical faith is: Believing what God has said is true, and acting on it appropriately. It is vitally important we know how the Bible uses certain words, in order to understand the Gospel as God has given it, as opposed to how people have messed it up. Scripture has no other category for faith. It never exists in a vacuum, is plucked out of mid-air, or is the fruit of my baseless belief. So it is with the Gospel. It is staggering to realize how often the Gospel is held out in terms of: Jesus made up the gap between your best efforts and what is required to be accepted by God. Go to the right Church. Stop doing too many bad things. Be religious – and I’ll save you. The Gospel is about Jesus coming to a totally lost and condemned human race – to pay the penalty for our sins in His own body on the Cross, because we have absolutely nothing we can offer to God to make ourselves acceptable under any conditions. The Bible tells us that we all sinned in Adam, and are enemies of God the moment we come into this world. Ephesians describes our condition in graphic detail: Ephesians 2:1–3 ESV / And you were dead in the trespasses and sins in which you once walked, following the course of this world, following the prince of the power of the air, the spirit that is now at work in the sons of disobedience— among whom we all once lived in the passions of our flesh, carrying out the desires of the body and the mind, and were by nature children of wrath, like the rest of mankind. Ephesians 2:12 ESV / remember that you were at that time separated from Christ, alienated from the commonwealth of Israel and strangers to the covenants of promise, having no hope and without God in the world. And so, John 3:36 ESV / Whoever believes in the Son has eternal life; whoever does not obey the Son shall not see life, but the wrath of God remains on him. Now having been made in the image of God as Genesis tells us – the truth is that even if we were to perfectly obey God in every thought, action and attitude, we would only be doing what was expected of us, what we were made for. That couldn’t possibly earn us anything. And if that were true before the Fall – how much more after? We couldn’t earn or contribute to eternal life in any way since we are already condemned. So even if we lived every moment for Him for the rest of our lives, we’d only be doing our duty – and still have no way to pay for our past sins! And the Gospel about Him. NOT a Gospel about giving us some sort of mythical second chance to do our best. 1 Corinthians 15:1–4 ESV / Now I would remind you, brothers, of the gospel I preached to you, which you received, in which you stand, and by which you are being saved, if you hold fast to the word I preached to you—unless you believed in vain. Jesus Christ died for OUR sins. He did so fulfilling God’s plan – it was according to the Scriptures. He was buried, and He was resurrected the 3rd day – also according to the Scriptures – according to God’s plan. That is the Gospel – the GOOD NEWS. God has dealt with our sin problem in the life, death and resurrection of Jesus Christ. The Gospel is all about who Jesus is and what He has done. It is not about what we can do either in ourselves, or even because of Him. We absolutely must have this clear in our hearts and minds. The Gospel is about Jesus’ rescue mission, not about a religious self-help scheme. This is why the Apostle Paul had to come to grips with how his own life as a profoundly religious and upright man was totally insufficient to save even him. All of which he summarizes so wonderfully in – 2 Corinthians 5:21 ESV / For our sake he made him to be sin who knew no sin, so that in him we might become the righteousness of God. This beloved is the Gospel. So do you know it? Do you know it is not about your being good, or making up for past sins or anything else you can contribute? Do you know it is about who Jesus is and what He has done? How He died for YOUR sins, and was raised up again for YOUR justification – the declaration before God that you are righteous IN HIM! And that He has sent His Spirit to indwell and empower you to persevere to the end – when He will raise you up from the dead as well. This is GOOD NEWS! This is the Gospel. But there is more to saving faith than just knowing the Gospel. Knowing the content of the Gospel, I now have to ask – do I agree that this is the truth? Do I believe this really happened and that this is what God was doing in sending Jesus? Has Jesus died for our sins? For MY sin? For YOUR sin? DO I believe this – what seems to be – TOO good to be believed news? Do I give my assent to the Gospel that it is true? If I don’t know what the Gospel is, then I can’t believe it. Some sort of disconnected faith or belief the Bible knows nothing about. But having heard and understood it – do I believe it is the truth? Fiducia – Will I commit myself to trusting this Gospel reality as all I need to be reconciled to the Father? Do I take Jesus as the full satisfaction for my sin before God, so that I am wholly accepted and loved by Him because of Jesus? This is the $50,000 question as they used to say. In truth, it is a question beyond worth in asking and answering. James Montgomery Boice used to use this illustration of marriage to try and bring all of this home. Let’s consider a young man and a young woman. This is Notitia: The gentleman made a genuine proposal of marriage. He has asked the question. So the gal must ask: Is that what I understand? Is that what he said? Was the content of his proposal that he asked me to marry him? Have I understood him correctly? 2ndly, Assensus: Have I believed that he wants to marry me and that we should be husband and wife, and HAVE I SAID YES!? Have I assented? If I haven’t said yes – I believe you really asked me to marry you but haven’t said yes – everything comes to a grinding halt. But if I have said yes, there is still one more thing to round out the entire scenario. So let’s roll this back. Have I said “I do” to Jesus’ proposal to be the complete satisfaction for my sins – to be all of my righteousness, and for me to be His bride? Have I consummated that by continually trusting Him in that way? By ceasing to look to anything else. By forsaking all others, and cleaving only to Him. This is what saving faith looks like. And it is not hard to determine if this has been your experience. And if so, then you don’t need to “feel” like your married. You don’t need to keep repeating the wedding vows. You don’t need to guess whether or not you’re good enough, since that was never a part of the equation to begin with – the Gospel being rooted in our salvation being totally dependent upon HIS being good enough. Now, you need to live in the reality of it. To truly trust Him in all that He promised. And so as Jesus says in John 17:3 ESV / And this is eternal life, that they know you, the only true God, and Jesus Christ whom you have sent. And then Jesus goes on to pray about all who believe in Him: John 17:20–24 ESV / “I do not ask for these only, but also for those who will believe in me through their word, that they may all be one, just as you, Father, are in me, and I in you, that they also may be in us, so that the world may believe that you have sent me. The glory that you have given me I have given to them, that they may be one even as we are one, I in them and you in me, that they may become perfectly one, so that the world may know that you sent me and loved them even as you loved me. Father, I desire that they also, whom you have given me, may be with me where I am, to see my glory that you have given me because you loved me before the foundation of the world. And so I want us to close just here this morning. I want us to take some time to wait before the Lord to search our own hearts to see if this is the case with each one of us here. Have you heard and do you know the Gospel, as Paul says in 1 Timothy 1:15 ESV / The saying is trustworthy and deserving of full acceptance, that Christ Jesus came into the world to save sinners, of whom I am the foremost. Do you BELIEVE the Gospel? Do believe this is true? Romans 10:9 ESV / because, if you confess with your mouth that Jesus is Lord and believe in your heart that God raised him from the dead, you will be saved. Do you put the responsibility for the whole of your salvation into His hands today? Romans 6:23 ESV / For the wages of sin is death, but the free gift of God is eternal life in Christ Jesus our Lord. In this, the whole of our assurance of salvation lies. Jesus Christ has died. And those who trust in Him, are saved forevermore.